Q: Cerebral palsy attorney Jesse Reiter answers a frequently asked question: Is hypoxic ischemic encephalopathy (HIE) associated with medical error during labor and delivery? Q: Cerebral palsy attorney Jesse Reiter answers a frequently asked question: Is hypoxic ischemic encephalopathy (HIE) associated with medical error during labor and delivery? 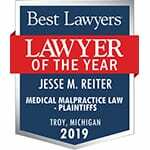 Q: Cerebral palsy attorney Jesse Reiter answers a frequently asked question: Is hypoxic ischemic encephalopathy (HIE) associated with medical error during labor and delivery? A: Yes, hypoxic ischemic encephalopathy (HIE), or birth asphyxia, can occur during labor and delivery as a result of errors made by obstetricians, nurses and other medical staff. There is a risk of HIE if a complication or condition arises during labor and delivery that causes a reduction in blood flow and oxygen to the baby and it is not quickly and correctly handled. Medical professionals are obligated under the standards of care to provide the appropriate care to ensure the safety of both the mother and the baby. When these standards are violated, it is considered negligence. A child diagnosed with HIE may have been the victim of medical malpractice. Nurses may have not monitored the baby during labor and delivery as they should have. Or a doctor may have failed to deliver the baby fast enough during an obstetrical emergency like a placental abruption or uterine rupture. Whenever HIE or disabilities are diagnosed in a child, it’s wise to seek help from an attorney experienced in birth injury matters. The attorneys at Reiter & Walsh ABC Law Centers have been helping families affected by HIE for years. Call us for a free consultation, 888-419-2229.